Many woodworking books fall under two distinct categories, the inspirational, giving us food for thought or highlights of a particular vein of woodworking, or the the more practical, providing hands-on step by step guidance. 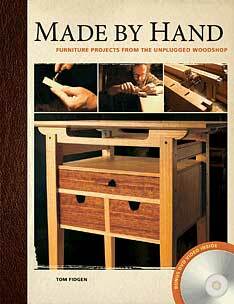 A book that straddles that line is Made By Hand by Tom Fidgen, published by Popular Woodworking Books. Fidgen belongs to the class of woodworker that eschews the realm of power tools to focus exclusively on hand tools. Rather than try and convince readers that his method is best for all, Fidgen writes of how the decision to work with hand tools was first a practical one followed then by a sense that they allowed him greater freedom to express his ideas. His work, as displayed in several cabinets detailed throughout the book, shows a design aesthetic informed by the simplicity of Japanese cabinetry as well as the work of renowned woodworker James Krenov. With an easy to read writing style, Fidgen describes his work, not as a retrospect from decades of experience, but rather as “recent adventures” detailing the trials and tribulations of a burgeoning woodworker. Spurred on by concerns of shop space and a need to feel more “natural” in the process of working with wood, Fidgen writes at length about the setting up of a comfortable shop space, not just in terms of size requirements, but also in putting thought to the flow of work. He also goes into detail about the various tools that he feels are indispensable. Stalwarts such as various hand planes, hand drills, and marking gauges are discussed, both in terms of the importance of acquiring good tools to start with, and the uses that may or may not be obvious to the beginning woodworker. Moving past the tools themselves, the discussion moves to the selection and preparation of wood as well as various ways of marking and measuring the selected wood for the task at hand. From there the topic moves to joinery methods he prefers, such as the dovetail joint, and the use of mortise and tenons. The practical application of these methods are featured in six well designed cabinets of various size and function, with detailed text and pictures outlining their construction. While recognizing the practicality of the skill of woodworking, Fidgen writes freely about the peace of mind he gets from his craft, giving voice to the concern of “why” woodworking traditions continue, not just the “how-to” aspect. While one could reproduce any of these cabinets from the text and pictures provided, one feels the real meaning behind this book is to inspire other woodworkers to find their “voice” in their craft. Made By Hand belongs in the library of any woodworking school, and on the shelf of anyone wishing a bit of inspiration, and a lot of practical know-how. The Best Bowl Gouge And then there was wood!